Curtains - is not only one of the most important elements in your interior, but also a necessary means for lighting control. What you need to know to pick them correctly? The charm of simplicity. For the office and the living room, made in classic style, it is better suited to long straight curtains lambrequins. Design of curtains require plain fabrics with rich color. You can also use a cloth with a bright print. 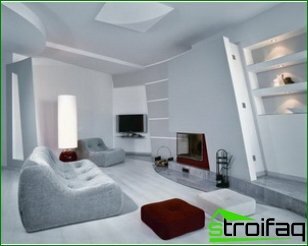 This option increases the visual height of the ceiling and camouflage the aesthetic shortcomings of windows. The layers of curtains. Classic curtains comprise five elements. As a base used by French curtains. But you can also use the Roman, Austrian or English curtain. The second layer is tulle. Third - podshtorniki or working blinds that regulate access to natural light in the room. They can be caught up with decorative curtains (quarter-layer) or hang freely. As a final layer is used pelmet, representing a drape top of the window. But you can do without the last layer. Excellent alternative tulle. Best of all these subtle shades suited for interior, made in classic English style. Blind presented a smooth cloth, having the bottom of the rounded fold. Design of curtains require precious fabrics with small print or jacquard pattern. Even more luxury. Curtains are similar to the English, but they are even more lush. The curtains look best assembled. As a rule, they decorate those areas, where it is accepted to spend the day. The cloth curtain prisborivaetsya on tape in an upright position, and bottom edges are shaped festoons. 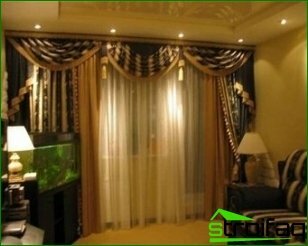 Design of curtains require a plain, light shades. 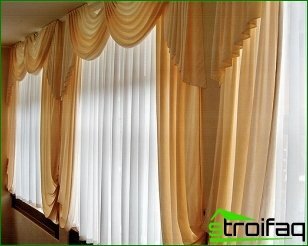 Drape curtains so light fabrics like voile, silk or viscose linen. And in business, and romantic. Traditional French curtains will look great in the office and in the bedroom. 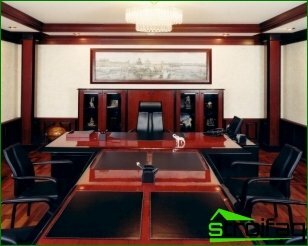 Blind is divided into vertical sections, draped horizontal, semi-circular folds, which are distributed very evenly over the entire height of the curtains. Design of curtains requires plain, bright, light and well-draped fabric. Almost blinds. Such rising blinds are perfect for any style. They can close the window aperture partly or fully. The panel is divided into equal horizontal sections, fitted with a rigid plastic wooden pole. Blind easily lifted by the cord, which is passed through the ring and the back side of the loop. The choice of fabric will depend on the type and extent of the interior the necessary protection from the sun's rays. Actual version. Curtains in the performance perfectly fit into any window. But they are best suited for fashion windows, made in a non-standard variant (round, trapezoid and a semicircle). These curtains are somewhat reminiscent of the Roman, but the window opening while fully closes. Design of curtains require fabrics having a high content of synthetic fibers, since they hold the pleating best. 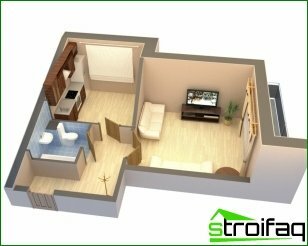 This option is ideal forsmall apartments. They look great on the balcony, the kitchen and the walk-through rooms. These curtains, reminiscent of Roman, have less decoration. They rise from the bottom up, allowing you to open only the necessary part of the window. Only on the desired degree of protection from sunlight and style of the interior will depend on the choice of fabric. Bamboo and wood. Blinds are great for different interiors. For example, bamboo blinds are perfect for premises, made in the ethnic style. A wood blinds look good in the kitchen. Horizontal blinds for windows can use a small size, and the vertical - in large boxes. Minimalistic aesthetics. Japanese curtains and kept simple. 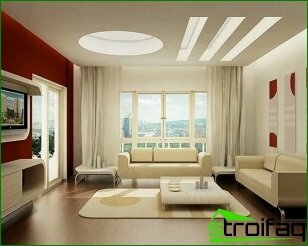 In appearance and principle of operation they can be compared only with vertical blinds. But unlike the latter they are made from a special fabric. The advantage of these blinds is that they are no creases. With this on the curtains do not collect dust. Japanese curtains - a kind of system of screens, which are mounted on a special multi-row eaves.